The Union Budget is a financial statement of government’s estimated revenue and expenditure for that particular year, according to the Article 112 of the Indian Constitution. 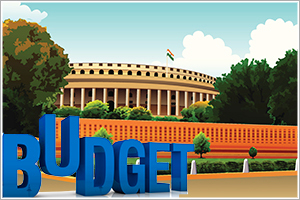 The Union Budget is prepared for a period between April 1 to March 31 each year and is classified into (a) revenue budget and (b) capital budget. On Feb 1, 2018, Finance Minister Arun Jaitley presented the Union Budget focusing on the rural economy and specifying aspects such as higher minimum support prices and a larger farm credit target. Further, he introduced a health insurance programme for ~10cr families with a cover of Rs5 lakh a year, now known as Ayushman Bharat. The budget also brought back the long-term capital gains tax on equity gains of over Rs1 lakh. Here’s a brief history of the Union Budget of India. India’s first budget was presented on April 7, 1860, when India was still under the British colonial rule. It was introduced by the then Finance Minister of India, James Wilson. The first Union Budget of Independent India was presented by the first Finance Minister of Independent India, Sir R.K. Shanmugham Chetty, on November 26, 1947. It is noteworthy that the first Union Budget was presented amidst widespread riots due to the partition of India. This budget was meant for seven and a half months, following which the next budget was to be implemented from April 1, 1948. It was the first Union Budget wherein it was decided that both India and Pakistan would share the same currency till September 1948. Sir Chetty resigned as the Finance Minister of India, and the responsibility ultimately was passed on to John Mathai, who presented the subsequent Union Budgets of 1949-50 and 1950-51. The budget of 1949-50 was the first instance of a budget being prepared for a United India, including all princely states. The Union Budget documents are treated with utmost secrecy, because any leak in official figures can have catastrophic effects. These documents are treated with so much secrecy that even the Finance Minister is not authorized to keep the Blue Sheet. The Union Budget is prepared on the basis of data and key numbers in the Blue Sheet. Only the Joint Secretary (Budget) is allowed to keep this important sheet. Until 1950, all important budget papers were printed inside the Rashtrapati Bhavan premises. However, an imminent data leak left the government with no option but to shift the process to a government-operated press in Minto Road till 1980. Post 1980, the printing of budget papers is done in a basement in the North Block, where the Finance Ministry is located. The Halwa Ceremony is a famous ritual, which marks the start of the printing of the budget documents. Understandably, officials who are directly in contact with the budget papers and data are locked down in the basement of the North Block. The Halwa ceremony marks the lockdown of the Finance Ministry. In this premise, even the Finance Minister is not allowed to carry a mobile phone. The Railway Budget of the country has always been introduced as a separate budget for the past 92 years till the year 2017, which saw the merger of the railway budget into the Union budget. Indira Gandhi was the only woman Finance Minister who was also the Prime Minister while presenting the budget. The present government has shifted the budget announcement from the last working day of February to the first working day of February. Indian Media termed the Union Budget of India for the year 1997-98, as the "Dream Budget" because it was the road map for economic reforms in India including dropping of income tax rates, removal of the surcharge on corporate taxes, and reduced corporate tax rates. The Budget of the financial year 1973-74 is known as the "Black Budget" as the nation had a deficit of Rs550cr. The one Union Budget that changed India’s future and was responsible for putting India on the road to accelerated growth was the Budget of 1991-92, presented by the then Finance Minister, Dr. Manmohan Singh. Under the leadership of P.V. Narasimha Rao, Dr. Manmohan Singh opened up India’s economy to foreign investors and eased up trade blockages. The Union Budget of 1997-98, presented by P. Chidambaram is also regarded as one of the turning points of the economy. This budget saw easing up of income tax rates and lowering of customs duties. Chidambaram presented the Voluntary Disclosure of Income Scheme in this budget. The scheme was aimed to curb black money in the economy and widen the tax net. The Millennium Budget, i.e., the Union Budget of 2000-01, is touted to have transformed the Indian economy into a tech-hub. Yashwant Sinha, who presented the budget, announced a reduction in customs duties for a few raw materials required for the production of the optical fiber by almost 10%, and by 20% in case of mobile phones. Some of the peculiarities associated with the Union Budget are practiced to date. For instance, till date, the briefcase is used to carry budget documents. Briefcases have been used since the presentations of the very first budget in 1860. In the end, the Union Budget is the roadmap of the government’s estimated revenues and planned expenditures for a particular year. It is one of the most important presentations in the Parliament.